The names of Pluto's two smallest known moons, previously referred to as "P4" and “P5,” have been formally approved by the International Astronomical Union (IAU). P4 has been named Kerberos, after the three-headed dog of Greek mythology. P5 has been named Styx, after the mythological river that separates the world of the living from the realm of the dead. 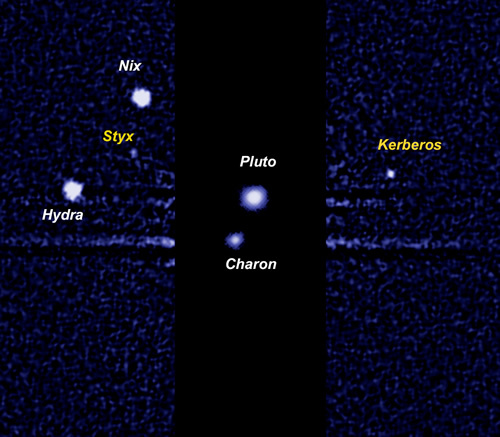 They join Pluto's previously known moons Charon, Nix and Hydra. According to IAU rules, Pluto's moons are named for characters associated with the Underworld of Greek and Roman mythology. Mark Showalter, senior research scientist at the SETI Institute in Mountain View, Calif., led the team of astronomers that discovered Kerberos and Styx. Both were first seen in lengthy exposures of the Pluto system obtained by the Hubble Space Telescope. Kerberos was discovered in 2011 and Styx in 2012. The images were obtained in support of NASA's New Horizons mission, which will fly past Pluto in July 2015. The names were selected based on the results of an unprecedented Internet vote that was held during February 2012. The ballot at plutorocks.seti.org received almost 500,000 votes, including 30,000 write-in suggestions. "I was overwhelmed by the public response to the naming campaign," says Showalter, adding that the website received international attention and half the votes came from outside the U.S.
Kerberos is the Greek form of the name Cerberus, which ranked second in the voting. Styx ranked third. The top vote-getter was "Vulcan," based on a suggestion from actor William Shatner of TV's “Star Trek” fame. Vulcan was the name of the home planet of Star Trek character Mr. Spock. The IAU gave serious consideration to this name, which happens to be shared by the Roman god of volcanoes. However, because the name has already been used in astronomy, and because the Roman god is not closely associated with Pluto, this proposal was rejected. "I am grateful to the IAU for giving such careful consideration to our suggestions," says Showalter. New Horizons will provide up-close looks at Kerberos, Styx and their companion moons in 2015, when it becomes the first spacecraft to fly through the Pluto system. "The discoveries of Kerberos and Styx add to the mysteries surrounding the formation of the Pluto system,” says New Horizons Principal Investigator Alan Stern, of the Southwest Research Institute. During the flyby, the spacecraft will also search for additional moons, which might be too small for the Hubble telescope to detect. Afterward, New Horizons will go on to explore the more distant Kuiper Belt. Watch the Google+ Hangout on the name announcement. Hubble Space Telescope image of the Pluto system, taken in July 2012.